Things are getting very blurry. The MacBook Pro once stood for tons of power plus upgradability. Add a Retina Display and now it's just tons of power. 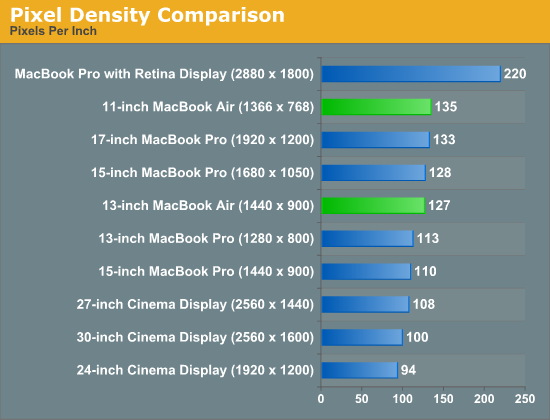 It's a thicker, faster MacBook Air (with an awesome display). It's not bad, in fact it's quite amazing, but it confuses the general order of things. The MacBook Air doesn't help in the clarity department. You can now order a MacBook Air with up to 8GB of RAM and a 512GB SSD, for the first time in MacBook Air history. Users who were once forced into Pro territory because of RAM and storage requirements can now happily live with an Air. And thanks to Turbo Boost, you do get similar performance in lightly threaded workloads. Take a step away from the Mac world and you'll see the rest of the market is going through its own confusing period. Nearly every single Microsoft partner is mixing tablets and Ultrabooks. If your tablet uses smartphone hardware, and can dock into a notebook or Thunderbolt itself into a desktop, is all of this a lot of confusion before client computing moves entirely to smartphones? NVIDIA said it would happen publicly (even Intel did so privately a few years ago). Maybe it wasn't just convenient rhetoric. Maybe that's where we're headed. Until then, there are going to be a lot of different form factors, all with very compelling features. The MacBook Air continues to be one of them. Despite the recent Ultrabook frenzy, the MacBook Air was one of the first (if not the first) to marry performance with usability, screen size/resolution, portability and battery life. Ultraportables prior to the MacBook Air's arrival in 2008 typically sacrificed in one or more of the above areas. I spent years in pursuit of the perfect ultraportable in college over a decade ago (30 is the new 20 right? ), and generally came away disappointed and empty handed. In 2010 Apple changed the expectations of cost with the MacBook Air. The new 11-inch model would start at just $999. And the 13-inch would only cost $300 more. The very first MacBook Air, by comparison, retailed for $1800. Apple took an ultraportable and made it its mainstream notebook. It was a bold move but one that was very forward looking. 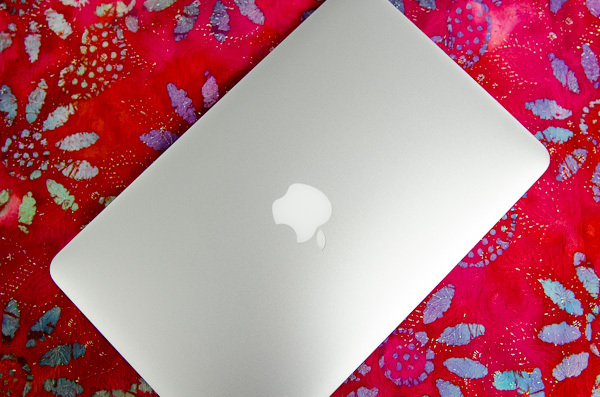 Today the MacBook Air is even more affordable. The 11-inch model still starts at $999, but the 13-inch version is only $200 more. From the outside not a lot has changed, but that doesn't mean there's any less to talk about. Ivy Bridge, USB 3.0 and faster SSDs are all on the menu this year. Let's get to it. Unlike the other thin member of Apple's Mac lineup, the MacBook Air chassis hasn't changed over the past three years. Since the 2010 update that gave us the 11-inch model and significantly lower prices, Apple has stuck with a design that only recently has seen widespread emulation. While our last review focused on the beginning of a new generation, this review takes a look at a very mature, yet still very good design. The MacBook Air is just so pleasant to carry around. It'll make even the new rMBP feel like a pig. 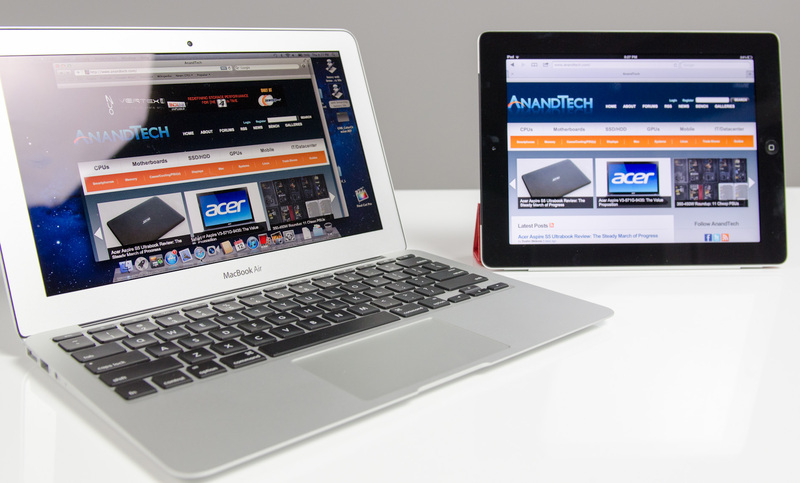 Both the 11 and 13-inch models are effortless to carry around. While I dread traveling with a traditional notebook, slipping one of these into my backpack is barely noticeable. You can get used to and take for granted just about anything, but the form factor of the MacBook Air continues to be a favorite of mine even today. The 11-inch MacBook Air is a great option for those who want the portability of a tablet but find themselves wanting to attach a keyboard to it most of the time. The 11.6-inch display boasts the highest pixel density of all of Apple's non-retina displays at 1366 x 768, but it's still quite usable. You don't make any sacrifices on keyboard size or key spacing (it's identical to the 13-inch model for the majority of the keys), nor do you have to give up any performance either. 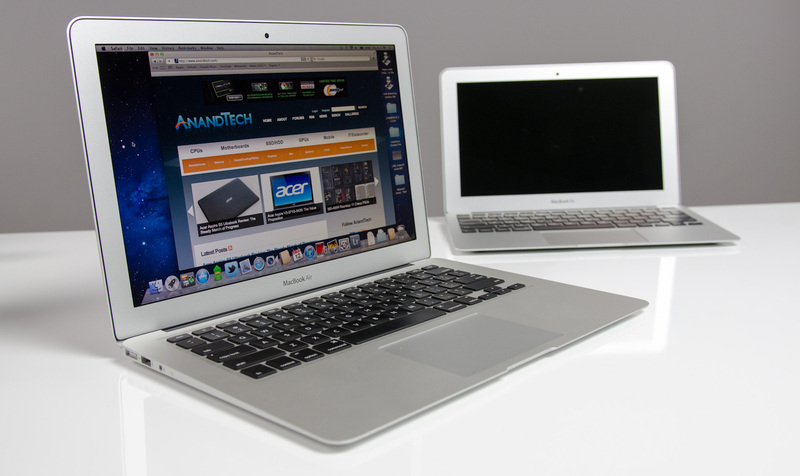 Apple offers all of the same CPU, memory and storage upgrades across both MacBook Airs. And with no discrete GPU, thermal throttling isn't really a problem either in the 11-inch chassis. With Thunderbolt, the 11-inch MacBook Air can actually give you the best of both worlds: an incredibly portable computer when you're on the go, and enough to act as your desktop when docked to a Thunderbolt Display. I've traditionally always bought the 11-inch MacBook Air with the thought that I'd carry it when I didn't need to lug around my MacBook Pro. I seemed to be fooling myself however as over 90% of the time I'd end up with the MacBook Pro. The 11-inch Air was relegated to typewriter duty when I needed a change of scenery while writing at home. It's a great writer's companion, but if I couldn't have more than one system I'd have to opt for its bigger brother. When I first reviewed the redesigned 13-inch MacBook Air I wrote that it felt more like a normal notebook, while the 11 was something a bit more unique. Perhaps I was more infatuated with the new 11 at the time, because these days I'm more drawn to the 13-inch MacBook Air as the notebook to have if you can only have one. You get a 23.5% increase in screen resolution on a display that's just easier to look at. While 1440 x 900 is a bit much on a 15-inch MacBook Pro, I'd say it's near perfect on the 13-inch Air. If Apple were to do the Retina treatment on here, it'd be magnificent. The larger chassis allows room for an SD card reader, which is thankfully quite functional. Otherwise the port layout is identical to the 11-inch model. In its role as a proponent of simplicity, Apple has reduced the decision between what Air to get down to screen size, resolution and battery life (the 13-inch chassis houses a much larger battery). If you like having more of all of those things, the 13-inch Air is for you. If carrying anything larger than a tablet upsets you, buy the 11.